Once you learn to tie and use the constrictor, you will wonder where it has been hiding in all those knot books and why it isn’t in wider use today. The constructor is based on the clove hitch, except that it has an extra half-knot that provides an extra hold when the knot is pulled tight. Like the clove hHitch, the constrictor can be tied using the end of the rope (see figures 19 and 20) or by forming a twisted loop and slipping it over a spar (see figures 21, 22, and 23). 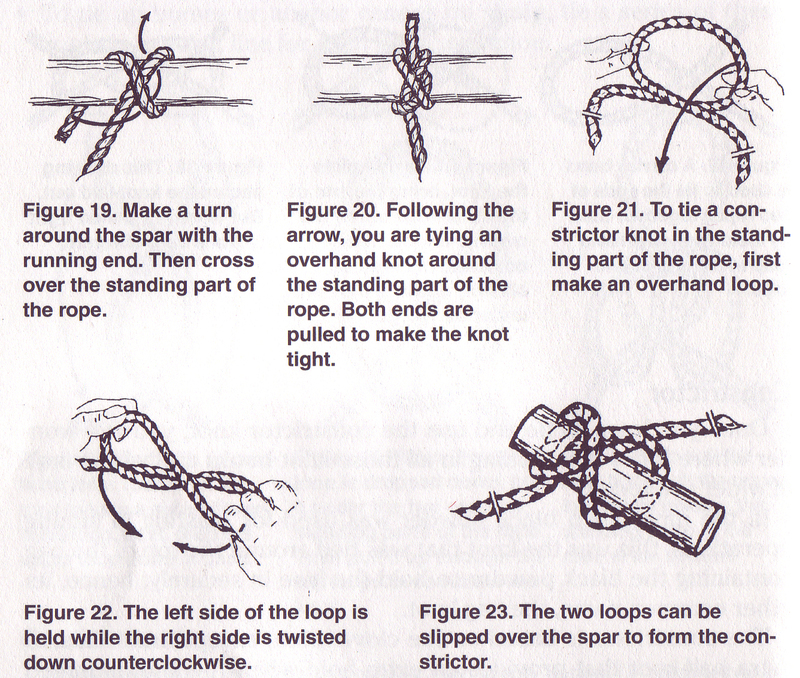 To use interchangeably with a clove hitch, except once the constrictor is pulled tight, it is quite hard to untie. To start a lashing. When it’s tied to a vertical spar, the crossing spar can rest on it while the lashing is being made. To make a good temporary whipping at the cut end of a rope, or to start the West country whipping. To start a splice, use it to stop off the unlaid strands of the rope so they won’t unravel further as you’re working the splice. * The constrictor is also referred to as a Miller’s Knot in that it was used to tie the tops of bags of flour.